EDITORS NOTE: Jimiyo is showcasing a template from Vol. 2 of Fitted Ladies Apparel Templates, which we’ll have ready for release in November. For now, check out Vol 1. Go Media gave me the chance to test out their new women’s t-shirt templates, and I have to say, they are awesome. High quality, crisp images that’s sure to impress my clients since presentation is paramount! They are simple to use, but here are some tips on how I used them. 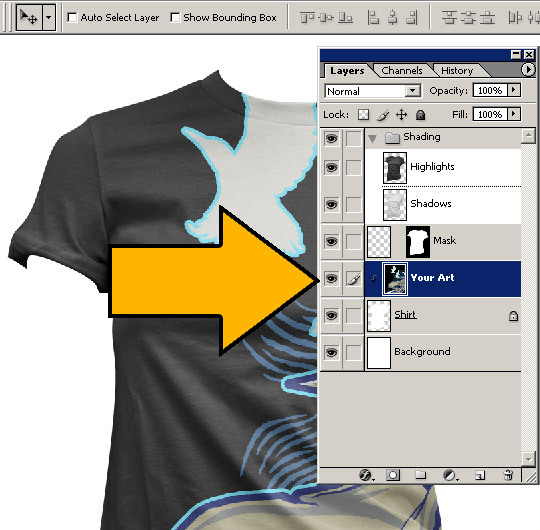 First, I copy pasted my flattened high resolution image into the “Your Art” layer. 2. Press ‘V’ to initiate the Move Tool. 3. You will notice alignment tools associated on the toolbar. 4. 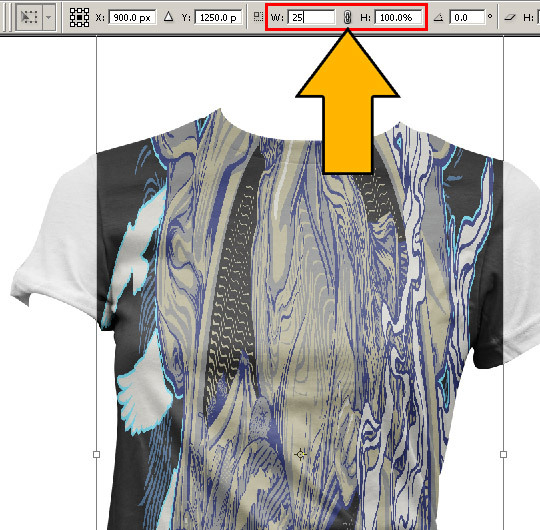 Click the center align buttons for vertical and horizontal and your image should be centered. Now with my image centered, I initiate the transform tool by using shortcut CTRL-T. In the toolbar, I link the vertical and horizontal, and play with the numbers til a good size is found. To constrain proportions by linking, click on the chain link icon. 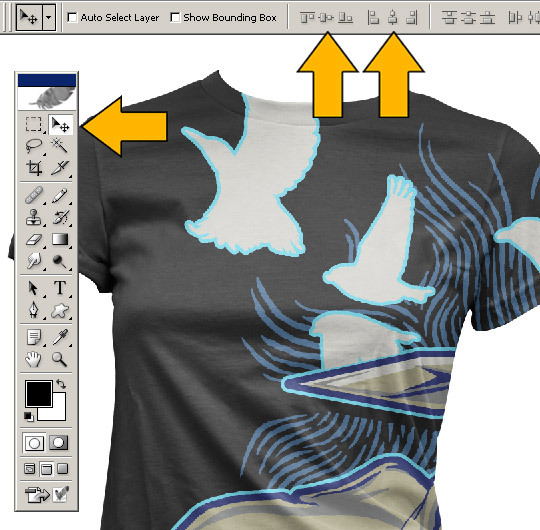 Once you arrive at a good size and position, fill the Material layer below the Art layer with the base color of the tee. This should match exactly with the bg color of the art image. Color pick while having the shadow and highlight layers turned off, and fill. 3. 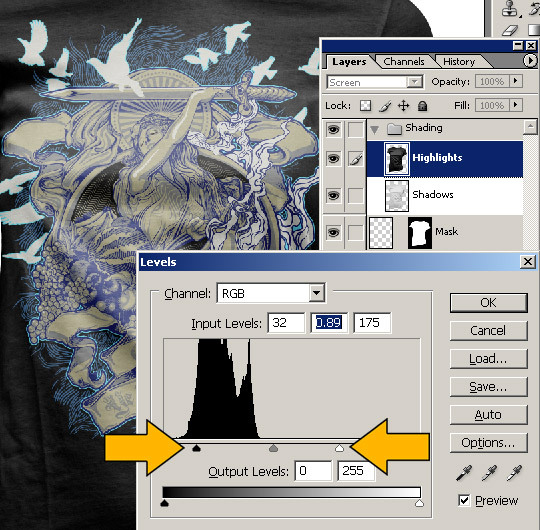 Hold ALT, press BACKSPACE to fill the current layer with the foreground color. Depending on what color the shirt is, I almost always tweak the highlights/shadow layers to optimize the realistic shading effects. Since this shirt was black, I tweaked the “Highlights” layer by using levels, as well as reducing opacity after leveling. In the final steps, I like to embellish the composition with a few extra additions. 1. Medium tone stroke and drop shadow. 2. 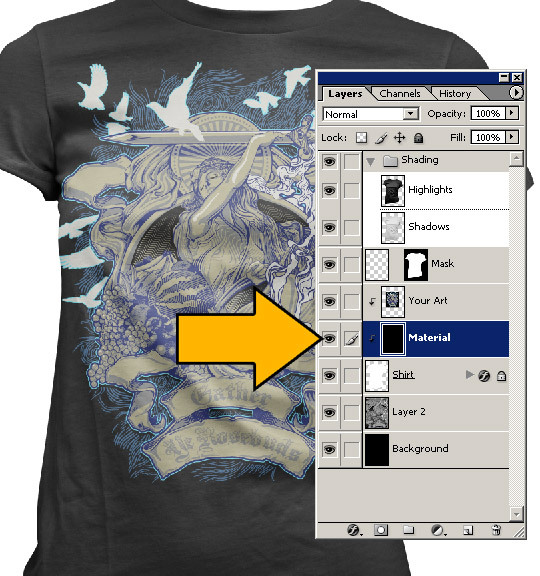 Enlarged, reduced opacity grayscle of the shirt image for the background. 3. After I flatten, I reduce image size for emailing. 4. After reducing image size, I run the “Sharpen” filter to Crispy it up a bit. Make sure to go under edit after sharpening and “Fade Sharpen” to tone down the filter effects. 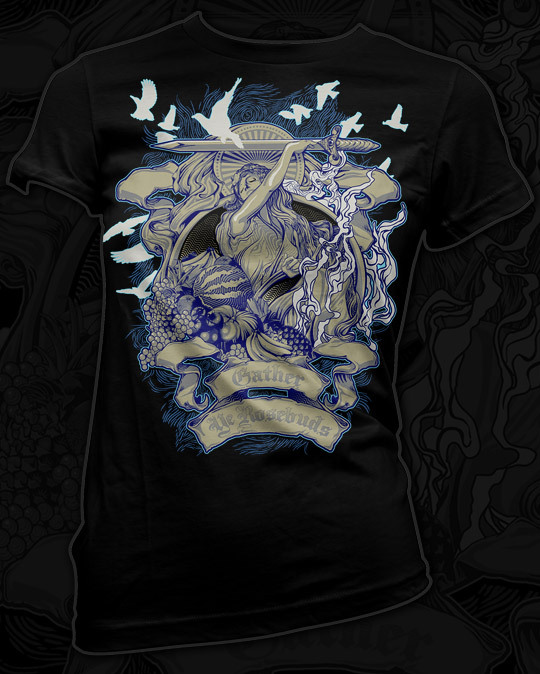 This is a shirt in running at Designbyhumans. If you guys throw me some votes, maybe they will print it! I'm a marketer, designer, armchair singer/songwriter, wannabe theoretical physicist/philosopher and recent college grad trying to pack as much living as possible into each day. Working at Go Media makes this pretty easy. Catch me on Twitter! !